Turkish vizier and viceroy of Egypt under Solyman II., the Magnificent (1520-1566). He received these honors as rewards for valor displayed at the conquest of Rhodes (1523). But Aḥmed had hoped to be made grand vizier, and in his disappointment planned to detach Egypt from Turkey and to declare himself its independent ruler. He sought to induce the Jewish farmer of the mint Abraham de Castro to place his name on the coins. De Castro pretended compliance, and obtained a written order to that effect over Aḥmed's signature. With this evidence he secretly left Egypt for Constantinople and informed Solyman of Aḥmed's treason. 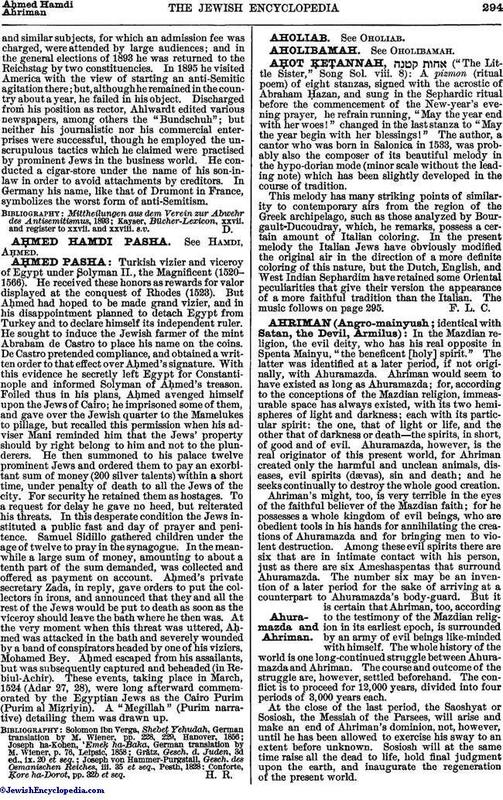 Foiled thus in his plans, Aḥmed avenged himself upon the Jews of Cairo; he imprisoned some of them, and gave over the Jewish quarter to the Mamelukes to pillage, but recalled this permission when his adviser Mani reminded him that the Jews' property should by right belong to him and not to the plunderers. He then summoned to his palace twelve prominent Jews and ordered them to pay an exorbitant sum of money (200 silver talents) within a short time, under penalty of death to all the Jews of the city. For security he retained them as hostages. To a request for delay he gave no heed, but reiterated his threats. In this desperate condition the Jews instituted a public fast and day of prayer and penitence. Samuel Sidillo gathered children under the age of twelve to pray in the synagogue. In the meanwhile a large sum of money, amounting to about a tenth part of the sum demanded, was collected and offered as payment on account. Aḥmed's private secretary Zada, in reply, gave orders to put the collectors in irons, and announced that they and all the rest of the Jews would be put to death as soon as the viceroy should leave the bath where he then was. At the very moment when this threat was uttered, Aḥmed was attacked in the bath and severely wounded by a band of conspirators headed by one of his viziers, Mohamed Bey. Aḥmed escaped from his assailants, but was subsequently captured and beheaded (in Rebiul-Achir). These events, taking place in March, 1524 (Adar 27, 28), were long afterward commemorated by the Egyptian Jews as the Cairo Purim (Purim al Miẓriyin). A "Megillah" (Purim narrative) detailing them was drawn up. Conforte, ḳore ha-Dorot, pp. 32b et seq.